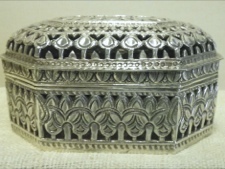 For centuries artisans in India have been producing all manner of utensils in intricately patterned and bejewelled designs for royalty and the priviledged using silver, brass and copper metals. 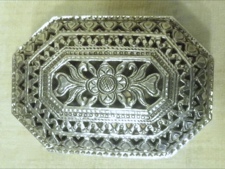 They have developed many artforms in metalsmithing such as filigree, enameling, Bidriware, and Koftagari. 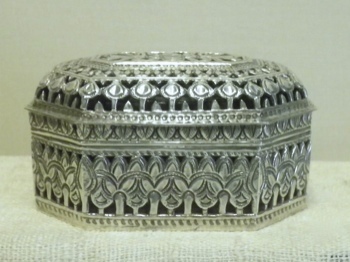 This sterling silver box is decorated in traditional bands of lotus buds and leaves in a cut out pattern. 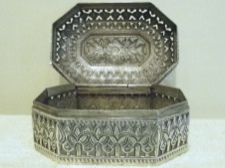 The box is 5 inches long in a octagon shapes and is 2.5 inches high.